Singapore Advanced Biologics Pte. Ltd (SABio) was founded in 2010 by two Duke-NUS professors, Prof. Mariano Garcia-Blanco and Prof. Subhash Vasudevan, who perceived unmet need in quality, on-time biologics for the research community in Singapore and the region. The vision and expertise of the founders helped SABio to efficiently attract investors. 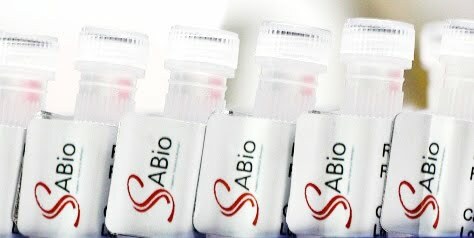 In 2011, SABio received investments from Bioveda Capital and SingHealth. Since its foundation, SABio has established a fully operational RNA oligonucleotide synthesis facility and started building its antibody catalogue. Currently, SABio offers quality siRNAs & RNA oligos, custom siRNA library production services, ready-made antibodies, antibody production services, and synthetic peptides. SABio's Board of Directors consists of its scientific founders, managers, investors, as well as business and scientific advisors. Each board member brings extensive knowledge and years of expertise in biotechnology environment, thus immensely contributing to SABio's research & development, product quality and growth. Prof. Mariano Garcia-Blanco, Co-founder, Director, and Scientific Advisor, is Professor and Chair, Biochemistry and Molecular Biology at the University of Texas, Medical Branch at Galveston. He is an internationally renowned expert in RNA biology and an author of more than 120 scientific publications. Additionally, he co-founded Intronn Inc. (now VIRxSYS, Rockville, MD, USA), an RNA therapy company and Veri-Q Inc. (part of Proteome Sciences plc, Cobham, UK). Prof. Subhash Vasudevan, Co-founder, Director, and Scientific Advisor, is a professor at Duke-NUS and an internationally recognized expert in antibody technology. He established the dengue research department at the Novartis Institute for Tropical Diseases in Singapore and is well known for his contribution to antiviral drug discovery research. Mr. Damien Lim, Director and Investor, has 20 years of experience in private equity and investment banking with various firms including PrimePartners, Vickers Ballas, Morgan Grenfell Asia, and Bioveda Capital. We boast expertise in siRNA, antibodies and peptides. SABio products can match or exceed the quality provided by the competitors due to our diligent quality control and assessment procedures. siRNA and RNA Oligos. SABio laboratories are equipped with RNA oligonucleotide synthesis capabilities, as well as specialists with required technical knowledge to supply RNA oligonucleotides. We synthesise RNA oligos, including siRNAs, providing top-notch quality control which will save you time and money, enabling you to focus on downstream applications. We offer high quality RNA for customers in Singapore and all of South East Asia with minimal delivery time. Custom siRNA Libraries. In line with our siRNA synthesis expertise, we also specialize in creation and production of custom siRNA libraries and screening sets. Ready-Made Antibodies. SABio offers a growing range of ready-made catalogue antibodies, which can be delivered to your research facility in Singapore as fast as the same or next business day after you place your order. Custom Antibody Services. We also provide quality custom monoclonal and polyclonal antibody production services. We deliver high-quality and reliable antibodies against your supplied antigen, and our service includes extensive testing, prompt customer support and competitive pricing. Peptides. We offer custom peptide synthesis services complete with various modifications, purity and quantity requests. All our peptides come with HPLC and MS analysis certificates.